Sunday: Increasing clouds. Highs in the 30s and 40s. 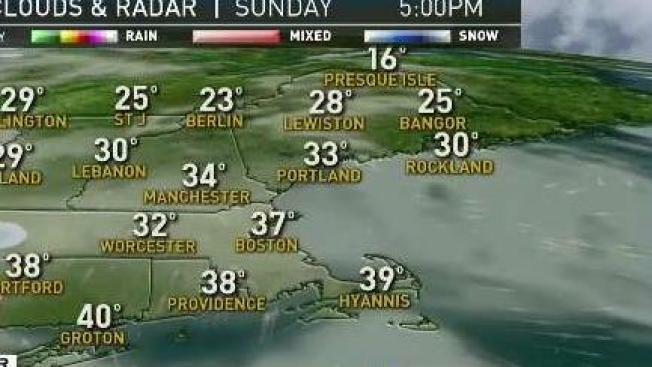 Sunday Night: Mostly cloudy, light rain and snow showers. Lows in the 30s. Monday: Mostly cloudy, light rain and snow showers. Highs in the 30s and 40s. 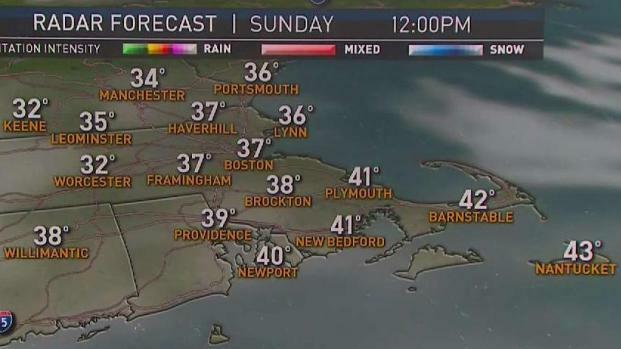 Cape Cod: Sunday: A mix of sun and clouds. Highs around 40. Sunday Night: Mostly cloudy, few rain showers. Lows in the 30s. Monday: Mostly cloudy, few rain showers. Highs near 50. Today will be colder than Saturday as clouds start to move in during the afternoon. A batch of light snow, sleet and rain will move in tonight. Minor accumulations are possible, especially north of the Pike and away from the coast. The last remaining precipitation will move out in time for the Monday morning commute. Another system will move in Tuesday. This system will also be weak with light precipitation. Light snow will be possible, this time north of Route 2. We’re expecting this clipper to exit by Tuesday night. Temperatures Monday and Tuesday will climb into the upper 30s and low 40s. Wednesday, the busiest travel day of the year, will be dry and cold. Thanksgiving might be even colder. Temperatures will only climb into the 20s and 30s. The weather looks to turn unsettled by the weekend. Temperatures will be warmer with expect high temperatures in the mid 40s.